Someone asked me when I first began to create picture books. When I think back, it was a few years ago. I was in Durham, North Carolina, at the time and my most vivid memory of the place is taking a walk in the suburb I was staying in. There weren’t any footpaths so I had to walk on the edge of the road in the shadows of the tall pine trees lining both sides. There was little traffic so it almost felt as though I was completely cut off from the rest of the world. There was only the changing colours of the sky framed between the tree tops to indicate the passing of time. It was in that space that I’d reminisce about moments in past places and imagine adventures in new lands. This is when I began to write and illustrate. Compared to a previous owl posting, I've tried to keep it simple here. How? 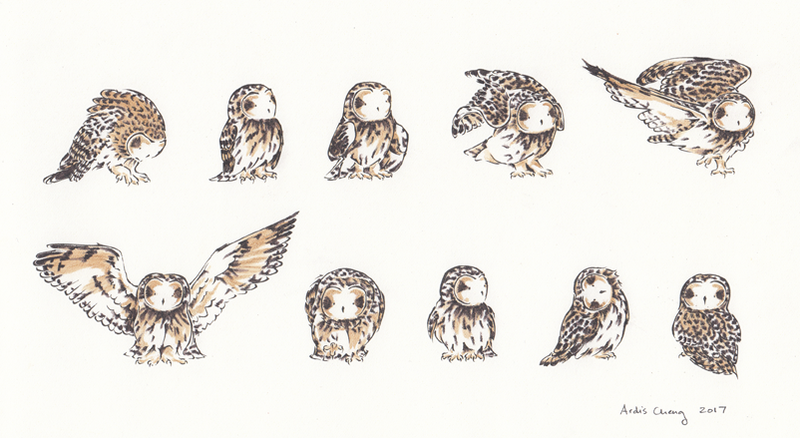 By limiting my actual drawing and colouring time to 30mins/owl and by parring down my range of tools to a pencil, an ink pen, two colours (compared to my usual blend of five or more) to distinguish them as short-eared owls, and a small paintbrush to smooth out the edges. 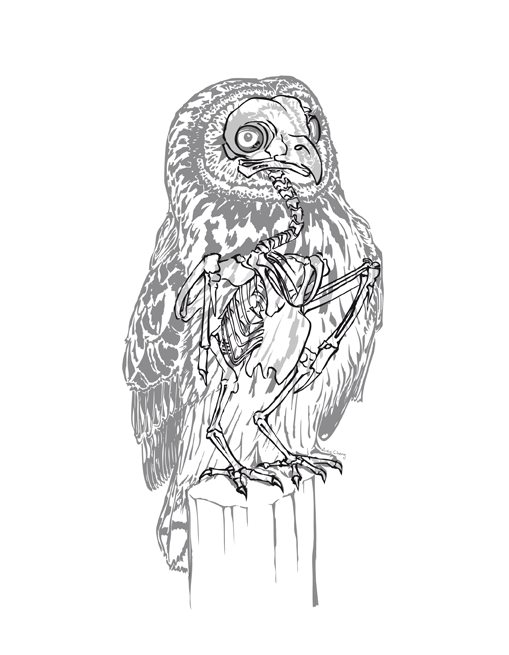 I recently learnt that owls have really long necks! They have 14 vertebrae compared to our 7. This allows owls to turn their heads 270 degrees, tilt their heads 90 degrees, and bob their heads up and down without moving their shoulders. This is really useful for them since they have tube-shaped eyes that are locked in place by bony sclerotic rings. They can't roll their eyes like us but can move their whole head to see what's around. 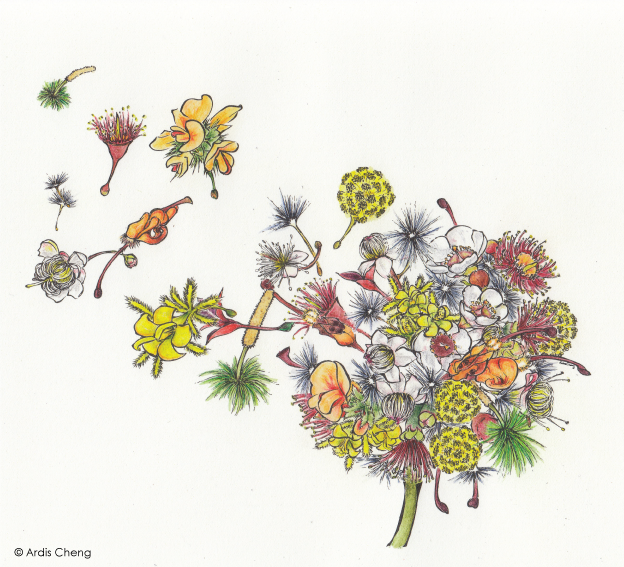 For the Botanical category for #CreateArtHistory, this is "Make A Wish", featuring some Australian flora: broad leaved lilly pilly, billy button flowers, dandelion fluff, dawson river weeper, golden wattle, grasstree, grevillea orange marmalade flowers, midgen berry, moonlight delight waxflowers, notched bush pea, red flowering gum, and winters light lilly pilly. As part of #CreateArtHistory with the State Library of Victoria and Redbubble, here is Friend or Foe, an illustration inspired by their category: Weird and Wonderful Creatures. It begins with a story idea. The story takes shape through numerous drafts of text and storyboard sketches. These are improved time after time with research into factual information, finding image references for my drawings, and input from friends. I am very fortunate to have an amazing group of editors to review each draft - Chrissy, Athena, and Rob. They challenge my story-lines and debate my word choices, all the while helping me keep my voice and style but making it better with each rewrite. For example, Simone in France had 8 drafts. Once I am happy with the story, I begin the final illustrations. This is where the story starts to become a book. Storyboard sketches are redrawn at a larger size and with greater detail. These drawings are inked, scanned, cleaned up, and vectorised using Adobe Photoshop and Illustrator. Turning the ink drawings into digital files makes it easier for me to cut and paste in small amendments. I find it easier to draw by hand versus drawing by computer and have redrawn full illustrations two or three times to correct bigger mistakes. When I'm satisfied with the digital image, I print the illustration out on watercolour paper. Using image references, I pick and choose colours for each element of the illustration. I mix and blend different watercolour pencils (from a set of 72) on scrap paper until I reach a desired effect and record each colour combination. I can now apply colour to the final illustration. If any colour mishaps occur, I will either reprint the illustration to start again, or reprint sections of the illustration to recolour and paste in using Photoshop. Simone in France has 28 illustrations but I probably completed closer to 40. 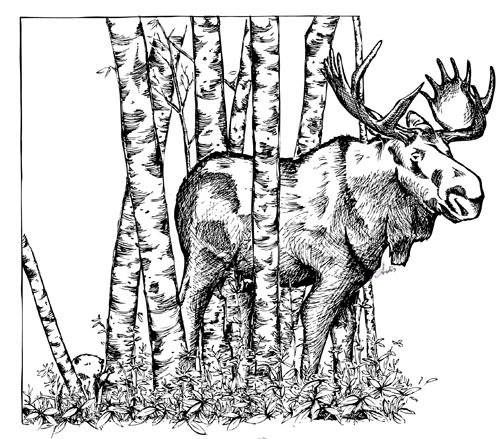 When all 28 illustrations are complete, they are scanned, cleaned up, and sized in Photoshop. I then import the illustrations into InDesign and format them with the text. Sometimes the text doesn't fit quite right in the illustration and I have to go back and do a redraw of part, or all, of an illustration. When the formatting is done, I share the file with my editors for a final proofread. With their approval, I assign a new ISBN and add a barcode to the cover. For the French versions, I mail a hard copy of the book to Mathieu, my French translator, who then sends me a brilliant translation in keeping with the spirit of the story. The final file is sent to a local print company to print and bind hard copies of the book. I receive a mock-up of the book to okay before printing the final product. This usually takes 2 weeks. Once I have the books in hand, I visit local bookstores to see if they will stock copies on their shelves. And that is how I make a picture book. Simone in France is Here! Simone in France has finally arrived! While Simone in Australia highlighted the beauty of Australian beaches and amazing wildlife, Simone in France is all about exploring and enjoying French food. Read more about Simone's new adventure here. I've started taking her around Melbourne bookshops so you can expect to see her pop up on shelves, beginning with Readings in Carlton, Collins booksellers in Croydon, and the Younger Sun in Yarraville. The past few weeks have been quite stressful as I prepared Simone in France for print. There were the usual last minute revisions to the text and minor additions to the illustrations. An added spanner in the works is my decision to do a limited print of Simone in France locally and then transition to print-on-demand (POD) in order to make Simone more easily accessible around the world. This will be especially useful for the, soon to be available, French version of Simone in Australia, as I haven't quite figured out the market for French books in Melbourne. Of course, the book dimensions have to be slightly different for POD so I have to go back and resize all the illustrations again. 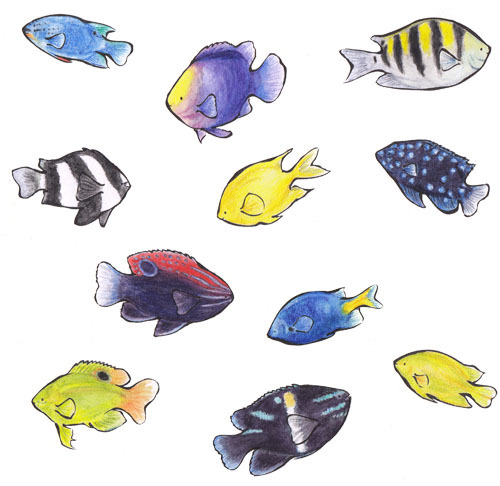 In the meantime, here is my collection of happy damselfish to hopefully brighten your day. I'm now at the stage of formatting and test printing Simone in France. Doing test prints of the illustrations are important as the colours on a computer screen can look quite different when printed on paper. Here is a test print of the book cover. I'm not 100% happy with the colour so will have to go back and do a bit of tweaking in Photoshop. While I finalise the book layout and look of the illustrations, this is also the time to review the text and triple check grammar, spelling, and punctuation. Here is a snapshot of one of the completed illustrations from Beaver, my graphic short story submission to the Lord Mayor's Creative Writing competition that closes this month. The story had to be formatted to fit a maximum of eight A4 sheets so now comes the challenge of reformatting it for a future book. Here is Cheers!, featuring a pair of rainbow lorikeets, a thank you card design I did for my grandpa. These colourful birds often stop by on the tree near my window and can make quite the racket. They certainly help keep the grey winter months a bit more cheerful. I'm working on a submission for a graphic short story competition that closes at the end of this month. When I hear "graphic", I think of comic books, so I've decided to change up my illustration style by using more ink, minimizing colour, and experimenting with different perspectives. Here is a close-up of one of the characters featured in my upcoming story Beaver. Simone at Paper Planes Co.
Simone has made the leap out of the state of Victoria! Simone in Australia is now in stock at children's store Paper Planes Co. in Mandurah, Western Australia. My books and cards are now available at Space2b, a wonderful creative space that features the work of independent artists. Proceeds go to helping newly arrived migrants, refugees, and asylum seekers transition to life in Australia. Space2b offers workplace and business training, mentorships and guidance to financial independence by building on people's existing skill sets and growing their confidence. They also serve as a social space to encourage arrivals to meet other people to expand their networks and make new friends, an important part of making any unfamiliar place feel like home. Many thanks to Mel and her daughter at Kids Books We Love for their book reviews of Christophe's Crumbs and Simone in Australia. You can follow them to discover other great reads to share with your little ones. For those who know me, you can imagine that Simone's expression here was pretty much my reaction upon hearing that (soon to be published) Simone in France was shortlisted and then "highly commended" in the Published Author's Illustrations: Illustrated Picture Books category at the Children's and Young Adult Writers & Illustrators (CYA) Conference in Brisbane on July 1. Oh, and if you're wondering, Simone here has just discovered the fève (i.e., charm) in her slice of galette des rois. Good thing Lilou is around to help her celebrate. This is a commissioned illustration I did featuring Atlantic puffins. Unlike my previous work, this one was quite the challenge as it was drawn at a scale two to four times larger than what I'm used to. Sometimes bigger is better as the puffins required a bit of detail that would have been much harder to do at a smaller scale. Here's one excited beaver wishing everyone a happy Canada Day! And for those who've helped review working drafts, I can confirm that this beaver is set to make his own book debut later this year (after Simone's upcoming adventure of course!). I recently attended a workshop that focused on the art of comics, cartoons, and graphic novels. One of the exercises we were asked to do was to draw 25 different characters in 15 minutes. As you can see, I only managed to create 16 in that time as, under pressure, coming up with so many different characters was quite the challenge for me. Hopefully you can still make out what each character is though. Unlike Simone in Australia, where I had completed multiple colour versions prior to the final illustrations, Simone in France hasn't undergone as many coloured sketch work. As a result, I've been doing a lot of colouring and recolouring of all, or parts of, the final illustrations. I'm thrilled to say that here is one illustration that I don't plan on retouching. Welcome to Lilou's hometown! All images © 2018 Ardis Cheng. Please do not use without permission.